Prestige Fireplaces Nottingham were established in 1994 and are manufacturers of fine quality made to measure solid timber wooden fire surrounds and natural stone fireplace hearths and inserts. Delivery is available throughout the UK. The factory and showroom is located approximately two miles from Nottingham city centre, one mile from Junction 26 M1 Motorway and easily accessible from Leicester, Derby and London. Here we display and have for sale a selection of wooden fire surrounds in a variety of woods; Natural slate, granite and limestone hearth and inserts; wood burning stove fireplace chambers; marble hearth and back panel sets; cast iron fireplaces; marble fireplaces; gas fires; mirrors; solid oak beams and mantel shelves, and are a premier stockist of Dimplex Fires. We use only the finest kiln dried hardwoods which include European white Oak; American black Walnut; European steamed Beech; Canadian hard rock Maple and African Mahogany. All timbers are legally sourced from renewable plantations and supplied to us by some of the largest timber importers in the UK. Our made to measure service is available normally at no extra cost. Having a fully equipped wood working machine shop, we produce wooden fire surrounds made to any size to suit all types of fireplace, including surrounds for gas fires; Electric fires; Solid fuel fireplaces; wood burning stoves and multi-fuel stoves. Oak fire surrounds are hand made from 100% solid oak and finished in a choice of 10 standard colours and finishes. We do not use MDF veneered boards. Colour matching service is also supplied. Fire surrounds are spray stained and lacquered to your chosen colour. This process seals the timber for life. Alternatively, fire surrounds can be either finished with bees wax or Danish oil. Only the finest quality kiln dried oak is used to manufacture fire surrounds and related products. The whole process of machining through to assembly and finishing is done on site. Delivery is available throughout the UK by our own dedicated drivers and the services of a fragile courier company. 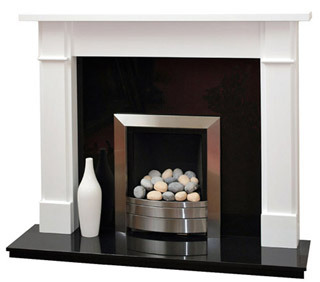 White fire surrounds are manufactured to a high standard and spray finished with hard wearing pre-catalyst paints. They are finished to a 20% sheen which is virtually matt and are easily cleaned using a soft clean damp cloth. We currently have three standard white and off white colours available. White Satin, Barley White Satin and Ivory Satin but most Dulux colours are available at an extra cost if required. 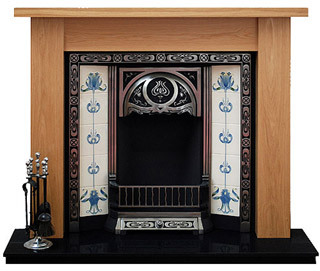 A selection of quality fireplace products can be viewed at the factory showroom which include: Limestone, Marble, Slate and Granite hearths and back panel sets, Cast iron fireplaces, solid oak beams, mantel shelves and Dimplex fires. If you require more assistance, please contact us, we are happy to help! 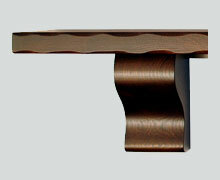 Just wanted to let you know that we are delighted with the bespoke oak fire surround we bought from you. It is really great quality and matches the colour of our furniture perfectly. Delivery also went well. Have now installed it with the slate back panel and hearth you also supplied. I would strongly recommend this company, they made a fantastic job of our oak fireplace in a very timely manner, it matches perfectly to the furniture and fitted very easily. Level of professionalism, customer service and quality is excellent. Just wanted to say Thank You for the solid oak fire surround you made for us, the wood and finish is lovely and the colour matches our furniture perfectly. Just a short message to say we have installed the new white fire surround and we are delighted. Thank you, it's lovely.